Talk about Food and Drink recipes. First things first, before I get into doing this review I would like to let people know of my method of coming up with a reasonable review. I rate these establishment by three categories. I give upwards of 10 points for food. This is judged by Taste, Quality and how it is presented and so forth. I give upwards of 5 more points to service. How fast it is made while keeping up the integrity of the dish as well as how friendly the servers are and how well they do their job. I also give an additional 5 points to having a good well maintained atmosphere as well as having a clean looking establishment. So now that I am done with explaining the method to my madness I am going to quickly give a description of the cheese factory and then I will then proceed with my review of the establishment. The Cheese Factory is located on the south side of Edmonton on white ave (82 ave) and 91 street. The Cheese Factory is not only a restaurant but also a retail establishment. They package and sell various items such as some canned goods, packaged gravy mixes, and of chorus many types of really great looking cheeses including some flavors I never have seen before like beer flavored cheese. When we were paying for our meal we had a chance to quickly talk with the owner. He had said that he has been to Quebec to learn many recipes for gravy and that he created his gravy from having that knowledge. He had explained to us that his gravy was MSG and fat free. I was pretty impressed about that. Usually the fat in the gravy provides a lot of flavor but there was no lack of flavor in this dish. They also make all the cheese there in house, which tasted really good and fresh. I was very impressed and it will show in this review. They have a pretty good selection of food for a smaller restaurant and I was pleased to see that they was variety as well. There is something for everyone. They have everything from poutines and 1/4 chicken to calamari and various sandwiches. All three of us decided to go with the original poutine. Freshly cut fries, with homemade gravy and fresh cheese curds. This dish for me gets a 10/10. 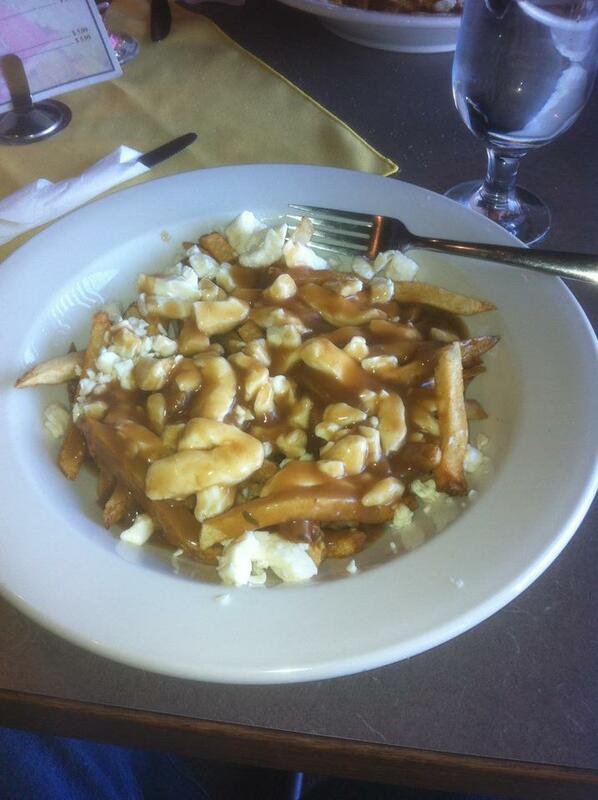 I am not one for poutines because it is hard to have a decently made poutine, until I came here. Everything tasted fresh and the cheese curds is what really makes it. This is hands down the best I have had in all of Edmonton. The service there was really great and very friendly. When you walk in you can sit down where ever you like, if there not busy I assume. As soon as we sat down, a waitress came and handed us our menus and ordered our drinks right away. When she came back she took our orders and came out moments later with our food. The food was served quickly, and you could tell it wasn't sitting, waiting to be brought out to the table. While we were eating they came around a few time and asked if we needed anything else which is what I like to see. All in all it was very good service and very friendly. For this I rate it a 5/5. This building has been there for years, and although I couldn't tell you how long it has actually been around for they have kept it up pretty good. They had a nice looking bar off to the left when you walk through the entrance. They had decent looking tables in chairs that seemed to be in great shape and good tableware. The one thing I would like to see in this establishment is better lighting. Instead of having that second entrance there which is lock anyhow, I would take it out and put in windows there so it lights up more of the establishment, in which in my opinion was just a tad gloomy. The lighting is still decent though and the restaurant has a very unique atmosphere. It is defiantly a great cafe style restaurant and for me this has earned a 4/5. This is definitely a restaurant that I would recommend to any one of my friends or family, and one that I will go back to in the future. I was impress with all aspects of the establishment and this has gotten a nearly perfect review in my books. I am looking forward to seeing this restaurant continue to provide great food and amazing service. If you are looking for a new place to try or if your just looking to buy cheese, this place is the place to check out. This has been my review of the Cheese Factory Restaurant. Find great content like this and more at C.J. 's Food and Drink official website at www.CJSFood.com. Also find us on Facebook. Questions? Comments? We would love to here them. Send us an email at ourblog@cjsfood.com or leave a comment below.